Daisy has reached 18 months of age, and still all puppy. Yesterday we watched her play - all by herself. She chased her tail numerous times, and caught it! 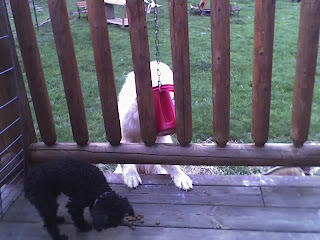 We left a black plant pot, in the yard and then decided we could not take it away. She picks it up, carries it around, slaps it around with a big paw. I was wondering why her face was covered with the red clay that is North Carolina dirt. She sticks her head in the pot and then flips it up over her back about ten feet in the air. Great fun! 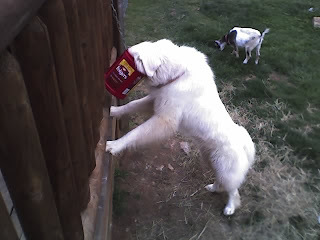 We've been trying to keep the goats out of the dog food. We have one little goat that has decided she will eat just about anything. We've come up with this solution. Daisy will even share her meal with Toby!